The top 15 solar PV module manufacturers of 2013 have been revealed thanks to a new report from the market research firm IHS. As many would no doubt guess, the list is dominated — yet again — by firms based in China. But, interestingly, the Japanese firms Sharp and Kyocera saw a bit of a resurgence — up a fair bit from previous years. Japan’s strong feed-in tariffs for solar and Japanese preference for Japan-made products was clearly part of this upswing. Some other things to note — Yingli Green Energy (aka Yingli Solar) once again took the top spot; 7 out of the top 10 companies were based in China; and the total Chinese share of the market fell 1% to 58% — down from a 59% market share in 2012. The Chinese as a group continued to be the star players of the global PV market, but there were also signs pointing to slower growth. While they continue to lead by far, 2013 also marks the second time their overall market share has not risen significantly. Chinese suppliers held a 57% share in 2011, 59% in 2012 and 58% last year. European companies also maintained stable share in 2013 at 13% — nearly unchanged from 2011 and 2012. In contrast, the Japanese module industry enjoyed an increase to 15%, up from 12% in 2011. Meanwhile, US suppliers fell behind as their portion dropped to 9%, down from 13% in 2011. While Sharp and Kyocera saw the most substantial rises, a third Japanese firm managed to rank in the top 15 as well, CIS thin-film producer Solar Frontier. 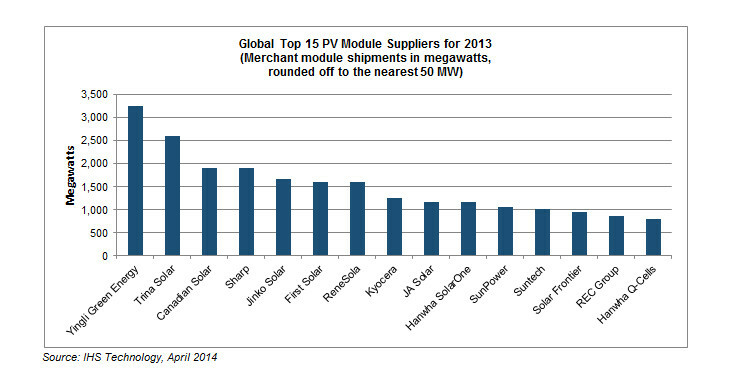 Solar Frontier saw shipment growth of more than 60% in 2013. The IHS report also noted that total global solar PV shipments hit 38.7 GW in 2013 — roughly a 24% increase over the previous year. Interestingly, much of the growth appeared to be from the top players — showing clearly the consolidation of the industry. The top 15 manufacturers held a 59% market share in 2013, up from 51% in 2012. With regard to the continued consolidation of the solar PV manufacturing industry, that’s something that’s likely going to continue for some time — with the dropping of state-support, in many cases, being one of the main drivers. That’s exactly what’s happening right now in China, with a recent order by the Chinese Ministry of Industry and Information Technology doing a lot to “clean up” the industry — likely finishing off over 75% of the country’s solar panel and related component manufacturers. Expect to see more of that in the near-future. And just note, this isn’t bad — it’s a natural part of a maturing industry.